Vote worse evil straight up. That’s the answer. Julan Assange said in a FOX interview during the election. Assange is a journalist who is seeking truth - not a political pawn. Some may find the Robert Mackay article at The Intercept interesting in pointing out how Wikileaks became a campaign arm for Trump. In that case you may be interested in Glen Greenwald’ s opinion of Assange’s arrest since Greenwald was a longtime writer for The Intercept. This more than a little interesting. According to a legal expert the law under which Assange being charged has a statute of limitations of 5 years. The alleged incident occurred in 2010 and the indictment issued in 2018 which exceeds 5 years. In order to make this stick the US Government will have to deem the actions of Assange “an act of terrorism”. This is more than scandalous. It is outright fascist. Of course you’re right. But the lack of evidence doesn’t matter to people who prefer belief derived from Party propaganda. The sad irony is that of course, the partisans on one side lambast the partisans on the other… for doing the same things: i.e. choosing belief and spin without question or logic and in the face of fact that contradicts it. The fact that alleged Russian influence was a molecule in a sea of corporate and other foreign influence (AIPAC ad buys & campaign donations, and Saudi money come to mind) also doesn’t matter to them. The self-proclaimed “liberals” will gladly knee-jerk and cheer on more military buildup, reheating of the Cold War, etc; as long as it aids partisan ends. And they’ll also go into “See no evil, Hear no evil” mode to ignore the fact that the U.S. has historically been the Meddler-In-Chief in the elections (and all other internal affairs) of other nations. 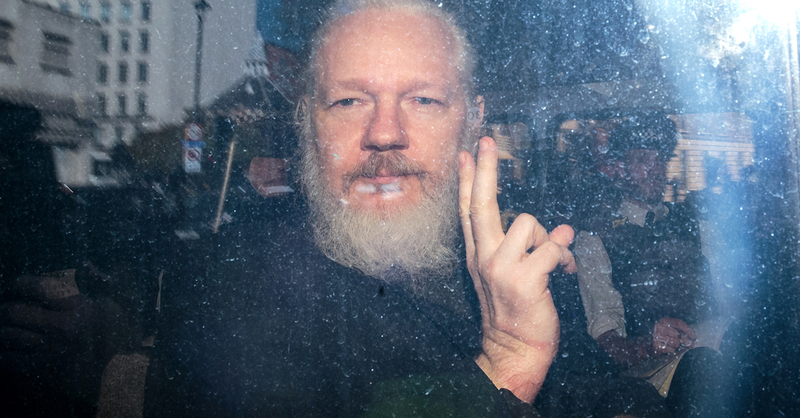 What saddens and sickens me even more perhaps than the personal injustices that are and will be suffered by Assange, who has risked life, liberty and well-being for the greater cause of facilitating the democracy that nations like ours only pretend to foster, is how easily manipulated so many among self-proclaimed “liberals” are now cheering his arrest. WikiLeaks harmed the Hillary Clinton campaign for the benefit of Trump; and so he “interfered” in our election. This of course ignores the fact that, long before WikiLeaks released the DNC and Podesta emails, Clinton’s unfavorable ratings were close to those of Trump. And widespread personal observation led me to the conclusion that those polling numbers reflected something far more than mere Republican or misogynistic leanings. I vividly recall conversations with younger women (and their friends and others, mostly unaffiliated voters), who were uniformly excited by the prospect of a Sanders presidency. A couple of them relayed that even their lifelong GOP parents were looking forward to voting for a D for the first time. But all said they could not bring themselves to vote for Clinton if she became the nominee. i even wrote the DNC back in early March, 2016, warning of what I saw,; and almost precisely predicting the actual outcome. Are those who claim Assange harmed Clinton not saying that somehow democracy would be better served if the DNC-Clinton collusion was unreported? Or that we’re better off not knowing about the torture, “collateral murder” and other war crimes that follows our foreign policy and imperialistic practices around the world? In any case, neither Russia nor Assange caused Trump’s win; no matter how much the MSM continue to push that narrative. the DNC, who rigged the nomination for one of the most disliked Dem. candidates ever, and those who chose her over Sanders despite all the warning signs: they were responsible. They chose to ignore all the warning signs and to turn an election which could have been a slam dunk landslide into a crap-shoot. But “blame the messenger” is SOP, when you don’t want to hear, much less address the message itself. So now these same “liberals” (I routinely quote that word because while they may self-identify as such, in my book being liberal once meant something far better than regurgitating establishment and spy-agency propaganda) are actually cheering the Trump administration for bringing charges against Assange that even the Obama justice department, which holds the record for going after whistle blowers, found itself unable to do. And these same liberals (new-liberals? neoliberals?) who scream about Trump’s attacks on the press (mainstream media at least) are now only too glad to punish WikiLeaks - one of the few media available to those willing to expose governmental and corporate corruption. And Democrats lament the divisions in their party! When will they get it that principle is more important than party, that democratic principles are far more important than the Democratic Party? How’s the weather at Langley today bro? their programs. READ: Mockingbird, Paperclip (200,000 ex-Nazis) and Gladio. dollars for GOLD which was transported in and out. Within the CIA and outside of it the CIA is known as "Catholics in Action." Trump of course has stated that he will move more guns abroad. And what leads you to say this …? And your talk of JFK possibly having a “real chance to save the planet” is an incredible stretch into??? and later to halt it – even further in trying to end the arms race. nuclear fallout came down as RAIN. In 1957 the Model of Global Warming was introduced to the public on TV. threats to the planet and hid it. threat to all nature – especially trees at that time. ended. Nikita Khruschev and JFK were working together for peace. chemicals being used. And which led to “Earth Day” now largely taken over by corporations. Perhaps I’m wrong, but I think conservatives have shut down some critical thinking over recent years on PBS. People see an occasional liberal show – and they think therefore PBS is liberal. Liberalism is few and far between on PBS. mention the ERA out loud to anyone else on the Supreme Court? Like whisper it into the ears of Sotomayor or Kagan? or Roberts? Papers – or lie of Gulf of Tonkin Resolution? Yeah, Ken Burns left out the fact of the people like LBJ, Nixon and so many others were Vietnam, war criminals that were never held accountable for their lies and the murders of some 58,000 Americans, many just boys, not to mention some two million Vietnamese! The reason I call the Pentagon and Congress a military dictatorship to support the Amerikan empire is that out of 100 senators only two ( one from Oregon and one from Alaska ) were not complicit in the lie of the Gulf of Tonkin Resolution. And the fact that none of the complicit, Vietnam, war criminals have ever been held accountable corroborates my contention that the Amerikan, government is and has been a fascist, dictatorial regime. but watch out for those “commies” … !! and I think actually it’s more like 4 million of them died doing it. forces against armies the size of the LAPD. That’s just one example. Russians did come in six months after the US troops were put into Afghanistan. around by the US/CIA and our MIC? Whatever one thinks about Communism as a government, the proof of the real reason that the U.S. government hates it is that form of government is an anathema to the oligarchs.